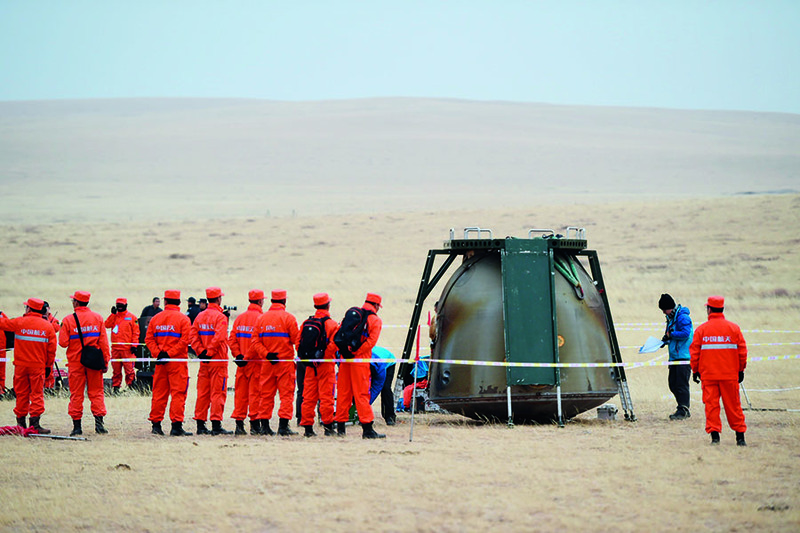 November 18, Inner Mongolia Autonomous Region: Staff prepare to check the reentry module of the Shenzhou-11 spacecraft after its safe landing. Chinese astronauts Jing Haipeng and Chen Dong returned to Earth safely on November 18, completing the overwhelmingly successful Tiangong-2 and Shenzhou-11 manned space mission, which lasted over a month, making it the country’s longest-ever manned space mission. At 1:11 p.m. Beijing Time that afternoon, Shenzhou-11’s reentry module separated from the spacecraft’s orbiting capsule before separating from the propelling capsule, ending the 33-day mission with a return to the planet. The reentry module landed safely at the expected site in central Inner Mongolia Autonomous Region at 1:59 p.m. This mission is a key step forward for China’s plan to build a permanent manned space station. The core module of China’s space station is expected to be launched around 2018, and the space station will enter full service around 2022, with capacity to continually operate for more than 10 years straight.